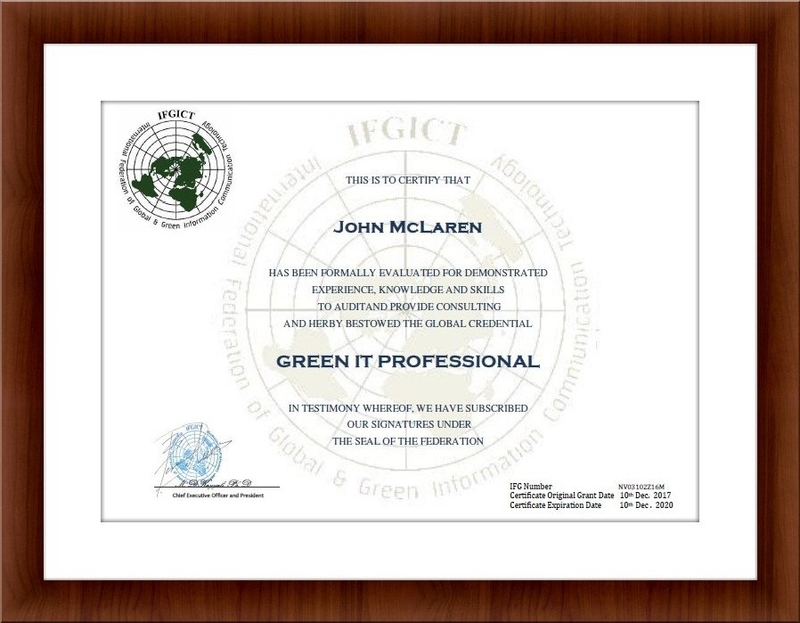 The “Green IT Professional” certification is the official training program offered by the IFGICT “Green ICT Standard” to all ICT professionals globally. The program is designed to develop the skills and knowledge for certified “Green IT Professionals” in the Green IT domain. 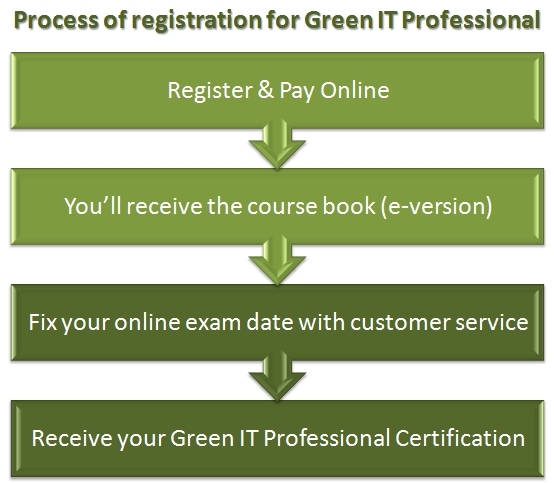 Upon successful completion and subsequent award of the Green IT Professional Certification the candidate will be authorized to conduct exam preparation & training to interested candidates through authorized an Green IT Standard “Training Provider”, act as a ratified and accredited as Consultant Auditor to perform consultancy services for the purpose of achieving and delivering the “Green Business/Government Certification”- as per the Green IT Standard in coordination with an authorized Green IT Standard Service Provider. The Certification is valid globally and is recognized by all Green IT Standard chapters/regions. 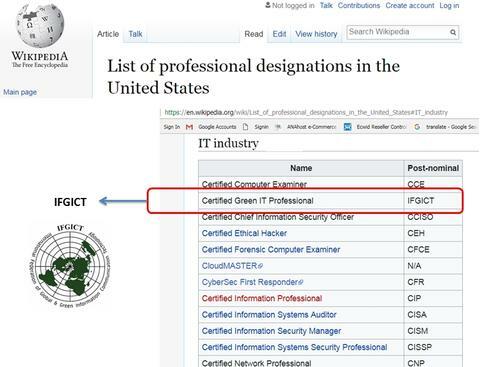 Why achieve the “Green IT Professional” Certification? The global demand for Green IT Professionals is on the rise. The workforce market for Green IT Professional has already started to experience a significant growth especially with major management consulting firms. A recent study of the US IT job market establishes that the demand for Green IT Professional is on the rise in the U.S and globally. Green optimization of the global ICT environment plays a significant part in engaging the global climate change initiatives. Only Green IT Professionals are able to sustain and maintain a reduction energy consumption and in developing techniques to reduce the greenhouse gases emissions attributed to the ICT usage. Fortune 500 company recruiters are on the lookout for Green IT Professionals. IT managers, IT engineers & IT specialist who are holding the Green IT Professional certification are essential assets to organizations today in order to manage Green IT departments and sustain the IT developed Green IT strategy of the organization where a significant decrease in energy consumption within their ICT environments is achieved. 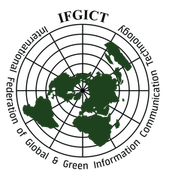 Anyone who is required to have an understanding of or an interest in green IT. This includes IT professionals as well as those responsible for corporate social responsibility and procurement or infrastructure. The Green IT Professional course is designed to be beneficial to a broad audience, not just IT leaders and managers. 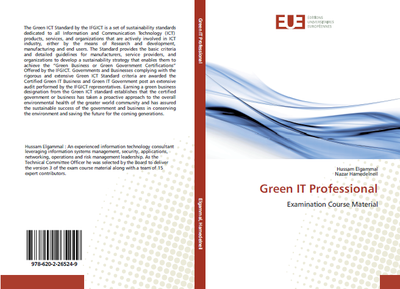 The Green IT course content is essential knowledge for career success as Chief Sustainability Officer, Facility Manager. Architect and Building Design Engineer, Procurement and Purchasing Manager, and Corporate Social Responsibility leader. There is also increasing demand for professionals in Sales, Business Development, and Consulting who are knowledgeable about sustainability for ICT. The course is self study costs $250 US, including materials, online exam and certification.